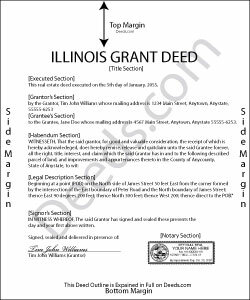 A grant deed, also referred to as a bargain and sale deed, is a legal document used to transfer, or convey, rights in real property from a grantor (seller) to a grantee (buyer). It contains covenants that the grantor has not previously sold the real property interest being conveyed to the grantee, and warrants that the property is conveyed to the grantee without any liens or encumbrances except for those specifically disclosed in the deed. Therefore, if the grantee later discovers that the grantor has sold the property to a third party, or if there are undisclosed encumbrances, the grantee may be able to sue the grantor for damages. Lawful deeds include the grantor's full name and marital status, as well as the grantee's full name, marital status, mailing address, and vesting. Vesting describes how the grantee holds title to the property. For Illinois residential property, the primary methods for holding title in co-ownership are tenancy in common, joint tenancy and tenancy by entirety. A grant of ownership of real estate to two or more persons creates a tenancy in common, unless a joint tenancy or tenancy by the entirety is specified. (765 ILCS 1005/1, 1005/1c.). As with any conveyance of real estate, a grant deed requires a complete legal description of the parcel. Recite the source of title to establish a clear chain of title, and detail any restrictions associated with the property. The deed must meet all state and local standards for recorded documents. Finally, the grantor signs the completed document in front of a notary. Once acknowledged, record the deed in the recorder's office in the county where such lands are located. Make sure to include all relevant documents, affidavits, forms, and fees. This article is provided for informational purposes only and is not a substitute for the advice of an attorney. Contact a lawyer with questions about grant deeds or for any other issues related to the transfer of real property in Illinois.